1. Make a chaunce with 6 T of the ghee. Add ginger root, cumin seeds, mustard seeds, the chili and cook until the cumin and ginger are dark brown and the mustard is popping. Add the hing, fenugreek and coriander. 2. Add the vegetable and stir fry a couple minutes. 3. Add enough water to almost cover the vegetables and bring to a boil. Then lower heat and simmer until vegetables are tender. 4. Meanwhile, add remaining ghee to a pot and saute the farina in it on low heat until slightly browned and very hot. 6. Combine the hot water and farina. Stir and cook on very low. The farina will thicken. Turn off the heat or continue cooking if you want to add more water to the desired consistency. Then add the pepper and a pat of butter and set aside covered. 7. Add the cooked vegetables (and remaining water if you want thinner upma)to the cooked farina. Squeeze on lemon juice before offering. 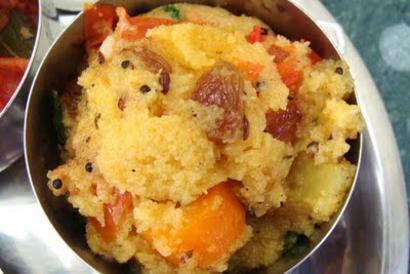 Thin upma is especially nice offered over freshly cooked rice.